Greeting and love, I, Archangel Michael extend to you now. I wish to make you aware of the angelic energies present within your being especially within your auric field, known as your Angelic Body. Your Angelic Body holds sacred vibrations of the Angelic Kingdom and allows you to connect and bring forth the qualities of the Angels into your being, reality and spiritual growth. Angelic Star Gateways exist within your Angelic body which is a level and dimension of your auric field. Angelic Star Gateways can lie dormant until activated. It is not appropriate to activate all Angelic Star Gateways within your Angelic body unless guided to, although through the activation of some of your Angelic Star Gateways you can create a larger Angelic Star Gateway akin to a portal or opening within your being which activates all your Angelic Star Gateways and aligns you to the dimensions of the Angelic Kingdom. Through the activation of some of the smaller Angelic Star Gateways you can access numerous angelic qualities, guidance, healing and much wisdom which you can bring into embodiment and expression throughout your entire being and reality. In order to activate an Angelic Star Gateway there is first a need to connect with your Angelic body, becoming familiar with its energy vibration and influence upon your being. Angelic Star Gateways hold the pure and selfless loving vibration of the Angelic Kingdom, only high vibrational light can be accessed through your Angelic Star Gateways within your auric field and from the dimensions of the Angelic Kingdom. These gateways can also act as a short cut or a focused connection to the Angelic Dimensions so you may access the Angelic Dimensions and bathe in their light with greater ease. Angelic Star Gateways can accelerate integration of the higher dimensions of the Creator’s Universe with your embodiment upon the Earth. I, Archangel Michael, invite you to connect with your soul, allowing your attention and awareness to rest within the presence and light of your soul. It doesn’t matter if you do not know where your soul resides within your being or body, your intention will allow for a connection to be made. Ask your soul to bring your awareness to your Angelic Body which exists within the dimensions of your auric field. Every person has an Angelic Body, it doesn’t mean that you are an Angel, it is simply a manifestation of your connection with the Angelic kingdom and all that is the Creator. Ask your soul to activate your Angelic Body so you may experience and accept its presence within your being. The more light we anchor into your Angelic body and the more you focus upon your Angelic body emanating and activating, you will become aware of your Angelic Star Gateways. You may see, sense or acknowledge an Angelic Star Gateway opening akin to a portal. Simply observe the gateway being present with it for as long as feels appropriate. When you feel ready you can allow yourself to move through the Angelic Star Gateway. You may or may not be then made aware of a larger Angelic Star Gateway which is the main gateway that aligns you to and supports you in connecting with the Angelic Dimensions. When you feel ready allow yourself to move through the heart of this larger Angelic Star Gateway and you will enter into the heart Angelic Dimensions. If you do not become aware of a larger Angelic Star Gateway, simply know the smaller Angelic Gateway will take you to a dimension of the Angelic Kingdom where the appropriate angelic qualities are available to you. The larger Angelic Star Gateway will direct you to the core and heart of the Angelic Kingdom and Dimension. The Angelic Dimensions are represented by the Archangels as each Archangel holds the space of an Angelic Dimension and the angels fill the dimensions. There are 352 levels or dimensions of the Angelic Kingdom. The Angelic Dimensions run alongside the Mahatma energies and dimensions as well as the dimensions of the Creator’s Universe. There are more than 352 Archangel in existence within the Universe of the Creator, so some Angelic Dimensions are overseen by many Archangels. After taking time to explore and connect with your Angelic body and maybe one or two Angelic Star Gateways. You may wish to sit in meditation or quiet time and call forth my energies, Archangel Michael as well as your community of Angelic beings and your soul to be present with you. As you connect with all who are present with you, ask the below questions out loud one by one, waiting to receive any guidance or inspiration after each. If information or an awareness flows, then you may wish to document it. If you do not receive any insights, know the questions have been asked and the answers will dawn within your awareness with divine timing. How many Angelic Star Gateways require to be activated to support my spiritual evolution, as well as embodiment and expression of the Angelic Kingdom and Dimensions? Will activating the required amount of Angelic Star Gateways activate all my Angelic Star Gateways and the larger Angelic Star Gateway? What benefits such as enlightenment, light templates, angelic qualities and so forth, will I gain from connecting with my Angelic body and Angelic Star Gateways? Which Archangel/s or Angel Guide/s are overseeing the activation of my Angelic Star Gateways and supporting my connection with the Angelic Dimensions? How many times a week is it advisable for me to connect with my Angelic Star Gateways? And for how many weeks until I embody the Angelic Dimensions and allow myself to be an expression of the sacred angelic qualities? How will connecting with my Angelic Star Gateways support my spiritual growth and the healing of my entire being? Take time to contemplate these questions and any others that you may have. Exploring your Angelic body and Angelic Star Gateways will boost your light quotient, awaken and deepen your connection with the Angelic Kingdom as well as your awareness of self as a divine sacred being of light. The more Angelic frequencies you anchor into your physical being, the more the Angelic energies will be present upon and within the Earth, supporting the ascension of all and Mother Earth. Master Djwhal Khul shares with you and explains your Soul Group’s current stage of ascension, with the initiations and activations taking place. He invites you to be a part of and to experience for yourself the ascension of your Soul Group. 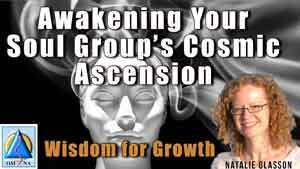 Discover how the ascension of your Soul Group impacts your current reality and spiritual evolution on the Earth. Experience a deeper understanding and connection with your Soul Group while lending your energies to support the cosmic ascension of your Soul Group. This mediation enhances your relationship with your Soul Group while empowering your being, enhancing your unity consciousness and realising you are not alone in your ascension pathway. I, Master Kuthumi, am the World Teacher alongside Master Sananda, we wish to bring forth an awareness of your ability to create peace within your being and reality. We believe that peace is needed now upon the Earth and will serve the transformational shift all are moving through of deeper unification and oneness with the Creator. The cultivation of peace will promote the further exploration of your intimate relationship with the Creator. I, Master Kuthumi wish to share with you an invocation to promote and cultivate peace on the Earth for all to experience. Then I will share my wisdom concerning this matter. ‘I hold the intention of uniting my energy as one consciousness with the purest and highest frequency of humanity and Mother Earth, so we may exist in the power, love, and truth we all hold, supporting and amplifying each other’s energy vibration. With the highest and purest vibration of my soul, the souls of humanity, Mother Earth and the Creator, let us create a system and network of light. May our brilliant and magnificent light flow throughout our beings and our united consciousness, forming and penetrating a powerful system and network of light upon the Earth. I acknowledge that I am love, I am peace and I am harmony. I acknowledge I create these harmonious vibrations constantly within my being, reality and as a collective with the souls of humanity, Mother Earth and the Creator. I open myself, souls of humanity, all earthly beings, and Mother Earth to the abundant healing, loving, blissful and peaceful vibrations of the Creator. I ask that we are all blessed, supported and loved eternally and that we experience this fully now. It is my intention from my soul to create the vibrations of peace on the Earth, to cascade throughout the realities on the Earth creating peace for all to experience, a peace that awakens from within and emerges into the physical level. It is my intention as a collective consciousness with souls of humanity, all earthly beings, Mother Earth to create the vibrations of peace on the Earth to cascade throughout the realities on the Earth creating peace for all to experience, a peace that awakens from within and emerges into the physical level. As I offer my light, love, and intentions as service to the Earth, humanity and the Creator, I call upon all aspects, qualities, and expressions of the Creator to draw close to me, supporting and guiding my actions, practices, healing work and intentions today. I first call upon the beautiful creative energy of Mother Earth to open like a flower and to cradle me and all in goddess powerful energy vibrations and presence. Mother Earth, I address you with great honour, respect, and appreciation. I love you unconditionally and wish to unite my energies with your being. I am here to experience your eternal love for humanity and every soul upon the Earth. I call upon your energies to amplify and assist my work today. I call upon the energy of nature, an all-powerful vibration of creative energy to spiral around my being and the presence of all upon the Earth. I ask the vibration of nature and the loving spirits of the trees, flowers, plants and all aspects of nature to lend us their light to support our intentions today. I ask the energy of nature to amplify all the loving vibrations of my being and all, enabling us to hold a deeper connection with nature on the Earth. Help us to cast away our veils of illusion viewing the truth of the Creator held within the vibration of nature. Please nature, lend us your support and love today. I call upon the crystalline consciousness that extends from the Creator and is embedded within the Earth and the crystal manifestations of the Earth. I ask that the crystal light and consciousness assist in cleansing my being, all and the Earth while also empowering our individual and collective light. Help me and all to retain and understand the wisdom of the Creator, existing as crystals ourselves on the Earth so we may hold a crystal-clear energy, mind, and expression today. We ask the crystal consciousness to lend us their loving energy today. I call on the elemental beings, the souls who care for the Earth and nature kingdoms. I honour all aspects of the elementals and welcome all loving elementals, who wish to be of service to our sacred hearts and the Creator, into our energy. I realise that for such a long time there has been a separation between elementals and humanity. I wish to dissolve this separation as it is no longer needed. I love all elementals unconditionally and ask that the elementals add their blissful energies to our gathering and intentions as we create and manifest the vibration of peace on the Earth. I call upon the energies and light of the Angelic Kingdom and Archangels to add their selfless love and to charge me and all with unconditional love, compassion and to intensify our healing abilities. I call upon the Ascended Masters to be of service to add and filter your wisdom and sacred consciousness into our collective consciousness, let us enter into our Ascended Master consciousness and self. Please protect, honour and guide us today. I call upon the Goddess vibration of the Creator to be present today and to awaken and blossom from within me and all, let the power of the Goddess inspire us and allowing us to celebrate our spiritual gifts and abilities. As I and all allow ourselves to be of service today let us accept and acknowledge our power and truth as a goddess being on the Earth. I call upon all aspects of the Creator’s light and love; I call upon the vibrations, sounds, energy, light and divine thoughts of the Creator to be with us today. Beloved Creator, I ask you to surround me and all beings upon the Earth completely in the sacred Creator vibrations, let us exist as one with all Creator aspects of our beings. With a golden circle of light woven around me and all, I allow myself to be an expression of my truth in this sacred space of peace and purity we have collectively created on the Earth now. I know I have the power to make a positive difference to the vibration of the Earth and the peace experienced by all. With numerous energies anchored into your being, all of humanity, all beings of the Earth and Mother Earth, take time to experience and allow the energies to synthesis. Acknowledge and know that through the anchoring of numerous aspects and qualities of the Creator you are creating an opening for all souls to access and awaken the vibration of peace from within their being, expressing it fully into creation and manifestation upon the Earth. Peace is cultivated within and experienced on all levels of your being and reality with your intention and dedication. Peace is born from your connection and unification with the Creator. Many souls upon the Earth miss this valuable understanding and seek to access or create peace through outside or physical actions. Peace forms from your acceptance of the Creator within your being and reality. Therefore, you can bring peace to any situation, experience or challenge by being present with and accepting the support of the Creator which is always with and within you. Notice that where peace no longer exists a connection with the Creator may be missing. Restore the connection with the Creator and allow peace to unfold, cultivating and directing peace to where it is needed. What Can Peace Create For You? A powerful question which can provoke transformation as well as realisation within your being and awareness is, ‘What can peace create for me now in my reality and spiritual evolution?’ If you allow yourself to bring your attention to the realisation that peace already exists within your being and with your focus blossoms to fill all that you are, sitting with this energy and knowingness you can contemplate the question. Allow yourself to be aware of how the presence of peace transforms and activates your being as well as what it inspires. Peace can create anything you wish to experience on the Earth, when you create from the space of peace everything flows with ease and perfection, allowing the purest vibration to exist within the manifestation. Imagine if every soul created their realities from a space of peace and the purest vibration of what they wished to manifest and experience on the Earth, how transformational and inspirational the world would be. Allow yourself to make a list of all that peace could and can create for you in your reality and spiritual evolution. Each time you focus on the presence of peace within your being, emanating and blossoming, you will also be energising all that peace can create for you. Archangel Metatron shares his guidance about how to clear and empower your channel as well as why it is important to do so. He guides you to align your channel, supports you in accepting the Arcturian’s powerful light technology to cleanse and purify your channel, as well as supporting you in recognising the purpose of your channel. He focuses upon your oneness with your channel and guides you to discover who is overseeing your channel. This is a wonderful meditation if you wish to maintain and raise the vibration of your channel or if you wish to activate your channel to instigate your channeling abilities. The meditation can be beneficial if you wish to cleanse and enhance the flow of Creator love and light through your being, opening your entire being to receive all that is the Creator. Master Archangel La- Na amplifies the truth vibration of the Creator and allows for a greater in depth understanding of the Creator’s will and vibration. As I, Archangel Metatron anchor the vibration of the Creator so La – Na supports in deciphering the vibrations of the Creator accessing and interpreting the wisdom of the Creator. We could say La – Na is the Creator’s interpreter. While wisdom is accessed and unfolds from the vibration of the Creator, it is very rarely spoken on a Multi Universal level; truth will manifest more as inspiration within the heart centre or the origin of the soul energy, and then can be transferred from heart centre to heart centre through bonds of light. La – Na assists in the manifestation of the entire reality of the universe whether it is the collective reality or an individual’s reality. Each soul and soul group hold an aspect of the Creator’s truth, La – Na ensures that these are expanded into realities for greater understanding. La- Na is a powerful part of the ascension process throughout the entire universe. Join Master Djwhal Khul, Lady Portia, Master El Morya and the magnificent Great White Lodge of Ascended Masters as they bestow their wisdom, sacred abilities and light frequencies upon you. They wish to share with you the energies of the Ascended Masters, so you may further access and understand your inner Ascended Master and pathway of mastery both on the Earth and the inner planes. They wish to inspire you to realise the immense support the Ascended Masters wish to share with you to strengthen your evolution in all areas of your reality and existence. The Masters will reveal to you different Ascended Masters, their energies and abilities which you can connect with, and share how doing so will assist your ascension. They will describe the next stages of Ascended Master awakening for you and humanity upon the Earth, as well as how the Ascended Masters are supporting Ascension now. The Ascended Masters have walked the Earth, they have realised themselves as the Creator’s light and truth, breaking free from the cycle of rebirth and devoting themselves to being of service to the ascension of all upon the Earth. They understand the larger picture of the ascension process you are moving through on the Earth, being able to guide you in how to be of service to yourself and others while remaining focused upon the awakening of your inner Ascended Masters. These Masterclasses also cover the best ways of integrating and synthesising your energies with aspects of the Creator to receive all you require and to awaken the truth of the Creator within your being. Join Master Djwhal Khul, Lady Portia, Master El Morya, the magnificent Great White Lodge of Ascended Masters and Natalie to enhance your relationship and connection with the Ascended Masters, awakening your inner mastery and to discover your pathway as an Ascended Master on the Earth and the inner planes. Benefits of the Masterclass: Deeper connection with self, enhanced awareness of inner mastery and Ascended Master Consciousness, experiencing the support of the Ascended Master Community and individual Ascended Masters, mastery the art of synthesis and merging with aspects of the Creator, discovering a divine inner drive that leads you forth. The Celestial White Beings invite you to experience their activation of Creator love. They wish to remind you and allow you to experience the magnificent, unique and exquisite presence of the Creator within you and the magnificent love that is available to you. They wish to support you in releasing resistance to loving yourself unconditionally and to love yourself as the Creator, while supporting a shift in your perceptions to allow you to more fully realise yourself as the Creator in embodiment and expression. The Celestial White Beings will invite you to experience loving yourself as the Creator fully and realising how this will impact your reality, actions and reactions. Allow yourself the opportunity to be the presence of I AM LOVE upon the Earth.